Julia Child’s Moules à la Moulinière…A pure delight. I am following with my promise to use my cookbooks and learn new things. At least once a month, my husband and I have a date night. We prepare a special meal together and later watch a movie. Yes, at home. Boring? No. I love being home and just relaxing with my best friend. So today’s treat was Julia Child’s mussels. It wasn’t my original plan but when I was in the supermarket last night and passing the seafood section, those little guys spoke to me. When looking at the recipe carefully this morning, I couldn’t believe my eyes. WHAT? No garlic? Every mussel recipe I had ever tried had garlic in it..Spanish recipes. But knowing that Julia has more culinary wisdom than I do, I just went ahead. It was a bit of a risk. My husband had always told me he didn’t like them. He had been in Brussels, tried them and hated them. So why did I bother? I remembered being in a restaurant in France where we were having a royal feast and he tried the mussels I was eating. To my utter shock, he liked them. I observed the sauce that the mussels had been in noticed that there weren’t many ingredients. Even in the taste, one knew that there weren’t that many. It was then I had decided to try making these little guys myself! The cookbook was set up and I went to work. The recipe and instructions couldnt have been easier. I waited for my husband’s reaction…. And the sauce was delicious. Garlic? What for? It was perfect. The best mussels I ever had. Try it yourself. Maybe you will surprise someone as well…including yourself! *We used the mussel shells as spoons to eat the sauce. Here is the simplest version of this most typical of French methods for cooking mussels. They are steamed open in a big pot with wine and flavorings, and it takes only about 5 minutes. Then the mussels, shells and all, are dipped out into soup plates, and the cooking liquor is poured over them. Each guest removes the mussels one by one from their shells with fingers or a fork and discards the shells into a side dish. In addition to shell dish and fork, provide your guests with a soupspoon for drinking up the mussel juices, a big napkin, and a finger bowl. 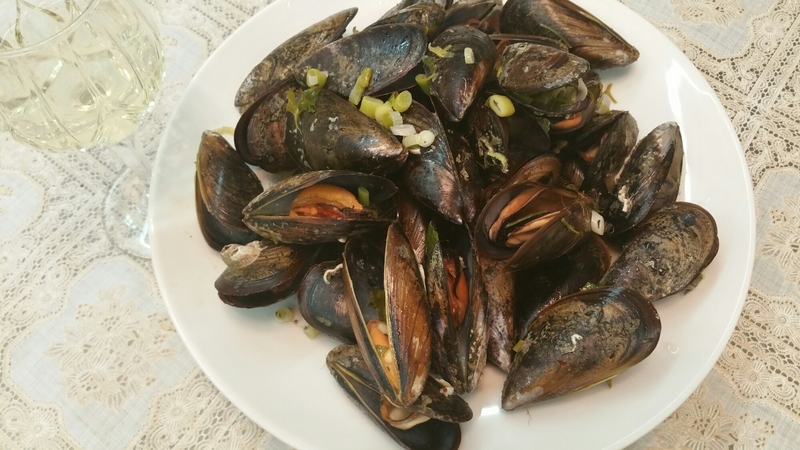 Along with the mussels serve French bread, butter, and a chilled, light, dry white wine such as Muscadet, dry Graves, or one of the Pouillys. 6 quarts scrubbed and soaked mussels. Bring the wine to the boil in the kettle with the rest of the ingredients listed. Boil for 2 to 3 minutes to evaporate its alcohol and to reduce its volume slightly. Add the mussels to the kettle. Cover tightly and boil quickly over high heat. Frequently grasp the kettle with both hands, your thumbs clamped to the cover, and toss the mussels in the kettle with an up and down slightly jerky motion so the mussels will change levels and cook evenly. In about 5 minutes the shells will swing open and the mussels are done. With a big skimmer, dip the mussels into wide soup plates. Allow the cooking liquid to settle for a moment so any sand will sink to the bottom. Then ladle the liquid over the mussels, sprinkle with parsley and serve immediately.